Azou serves a variety of dishes from Morocco, Algeria and Tunisia made with carefully sourced and fresh ingredients. You can relax in the warm and inviting ambience where you will be welcomed with friendly and efficient staff. Selection of wines and beers including Casablanca beer and Moroccan wines. Ramsay's Best Restaurant 2010: Semi finalist and winner of North African category. at all times but be advised there is limited space and high chairs are not available. What did you think of Azou? I think Azou do belly dancing but I’m not sure, the waiter told us you have to phone ahead. They do have those water pipes though, with the fruit tobacco, which are great to puff on while you lie back on cushions. Azou is a really nice change, much more laidback than most restaurants. I have been to Azou many times, with different friends or family, and we always have excellent food and service. Recommend! I had the worst experience ever! I will never go back! Started the whole evening OK and the appetisers were great. The problem started when I order for my main course a sea bass fillet and they gave me a hake fillet!! When I told them that that wasn't sea bass the chef came out and had a go at me!! I never had to deal with someone so rude in my life! The waiters didn't say anything to us either and I was very disappointed, to then find out that the reason why the waiters were so quiet was because the chef it's their boss!! Went to Azou last night.03/02/11food ok, my tagine romanne was rather sweet, starter was excellent thoughi came to pay the bill and found that as we were a group of more than 4, we had to pay a set menu cost of £25 each. When I looked at the cost on the menu, it was £6 cheaper! Their argument was that as there were more of us, they were unable to turn the table over twice and it was harder work for them! Beware of their strange pricing policy! Following recommendations from friends - can confirm that we had a lovely evening - great food, great service, relaxed and interesting atmosphere, good value too. Definately recommend. My friends and I had the opposite experience to 'anonymous'. Fantastic food, friendly service and a great evening. I would recommend this gem of a restaurant to anyone. We had a very bad experience with Azou and will never go back! We were rushed thro our meal and the waiting staff was rude and asked us to order at least one main course each person and no sharing as the restaurant had to make money!! Had a lovely birthday meal at Azou, started with the hummus - very tasty. My friend had a 'brik' - thin, crisp pastry filled with tuna, potato and egg and it looked delicious! My Tagine King Prawns was superb - sauteed in garlic and herbs and served with a crab saucea dn it all went down very nicely with the House wine. Azou is great value and I would definitely go again. 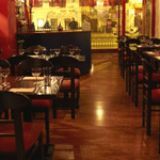 Azou is an intimate, family-run restaurant with a super relaxed atmosphere and good, honest, authentic cuisine. Visit here for a taste of North Africa in London. Azou has a distinct Moroccan feel to it. The dercor is bright and tasteful, with orange walls, brass lanterns and rustic rugs adorning the tables - creating a warm, traditional atmosphere that is guaranteed to transport you to far away lands. 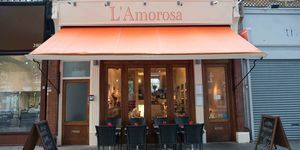 The owners are extremely friendly and the atmosphere is relaxed and informal. Sitting at your table feels more like being at a great dinner party than at a stuffy restaurant. It’s not just about the food here, it’s about the experience. Azou has won several awards, and it is easy to see why. 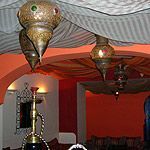 The owners have used their expert knowledge of North African cuisine to create a varied menu of exceptional quality. As the portion sizes are generous, a nice light starter is favourable. The homemade hummus (£3.90) with grilled flatbread and spicy olives make a delicious choice. The hummus is subtle, with a hint of garlic and has a moreish creamy texture, whereas the olives have a distinct peppery flavour and a chilli kick. The traditional tagines, which start at about £8, make for a perfect main, served up in authentic dishes with an accompaniment of fluffy rice or cous cous. The vegetable tagine is packed with succulent vegetables that soak up the delicately spiced sauce – the chunks of aubergine, peppers and onion complement each other nicely. The fish tagine is outstanding, with a mouthwatering combination of king prawns, cod and mussels. The flavoursome fish is served in an olive, preserved lemon and spice sauce – creating a light, zesty flavour. After the meal, enjoy a fruit salad with orange blossom water (£3.25) or opt for the vanilla ice cream (£3) with orange blossom, honey and almonds. This unique dish is sweet and creamy, and incredibly delicious. There’s a good selection of alcoholic and non-alcoholic drinks available at Azou, including beers, wines, spirits, cocktails and teas, coffees and juices, all well-priced. You can also sample one of the many Moroccan wines or opt for a lighter choice and try the house rose which is light, fruity and easy to drink. This small family-run restaurant is everything a good restaurant should be. The service is great, the food is superb and the atmosphere is un-pretentious and welcoming. 43 destinations curated by View . 48 destinations curated by View .